I was in Paris earlier this week. One afternoon I walked through the Jardin des Tuileries toward the Place de la Concorde looking for the bookstore where I had bought a copy of Madeleine the last time I was there. I was happy when I saw this sign and went inside to look for another book to buy and take home. 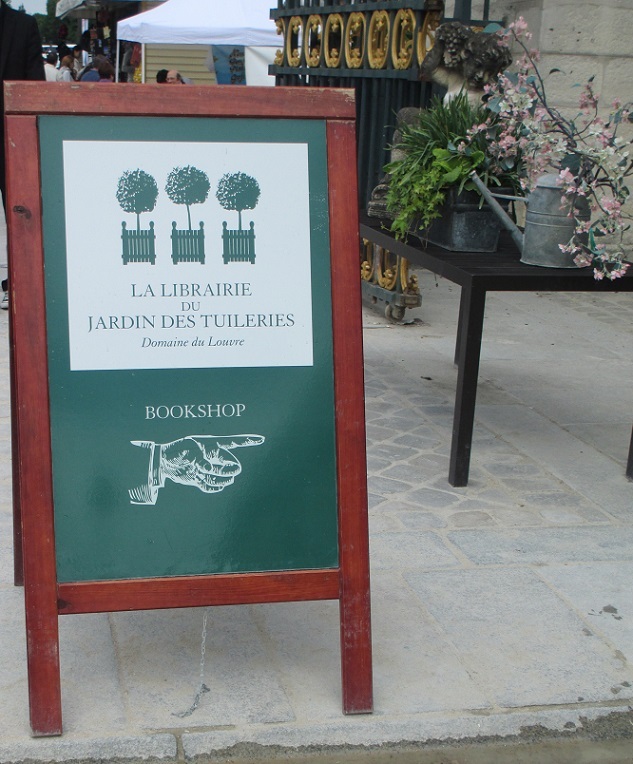 This entry was posted in France, Paris, Travel and tagged bookstore, Jardin des Tuileries, sign. Bookmark the permalink. Very cool, so which book did you buy this time? I bought a lovely book about gardens and gardening. It is a wonderful keepsake! What a quaint sign– looks like something I would have loved to take home to put on a wall or something! :) Lovely picture, Meg. Thanks, I really liked the sign too. It was quite artistic! Lovely and so French. Looks like they whitewashed the brickwork too, which makes everything else stand out so well. I thought the sign was charming and it really stands out – good observation Sharon! Who would ever guess that a sign and its surroundings could be so charming?! That’s what I thought – it was simply perfect! Nice sign, any booklover would be happy to find it. I also like the watering can of flowers in the background. I liked the flower arrangement too – it helped create a lovely tableau! The sign and display looked so appealing that I just had to go in! Walking through the Jardin des Tuileries – how magical. Nice graphics on the sign …. Ahhh, bookshops in Paris. Lucky you – That’s my idea of heaven. Great shot. I couldn’t agree more – it has a real sense of style! Once I saw that sign I knew I had to go in. And it was a wonderful bookshop! Books: the perfect memento of a trip, and the perfect consolation for when you’re *not* on one! I’m with you…a book store anywhere, but particularly in Paris with such a fetching signage would absolutely lure me in. I thought the sign was charming, and the shop had so many beautiful books it was hard to decide which one to buy! Meg! How are you? I love your post, thank you for taking me to Paris for a moment! I LOVE the sign. I stop in bookstores wherever I visit. Books are the best keepsakes for sure. It was such a wonderful sign and the bookstore was simply delightful! I do love Paris and they have so many bookshops! Glad you found yours. Do you read French? Or were the books in English. Either way what a wonderful idea of a souvenir. I so love books. That’s a great thing to do when you travel – thanks for sharing that! I love the sign and everything around it! How charming! Lovely composed photo! Thank you Judy – I thought it was a very pretty sign!